McDonald's Inc. (MCD - Get Report) plans to double the number of locations it has in China by 2022, Reuters reported earlier on Tuesday. The company plans to add about 500 stores annually until it has about 4,500 locations in the country. Opening up the profitability of the fast food market in China has been decades in the making. This year marks the 30-year anniversary of Yum! Brands Inc.'s (YUM - Get Report) Kentucky Fried Chicken becoming the first U.S.-based fast food chain to open a store in mainland China. To this day KFC remains the most popular American fast food option in the country of 1.6 billion. 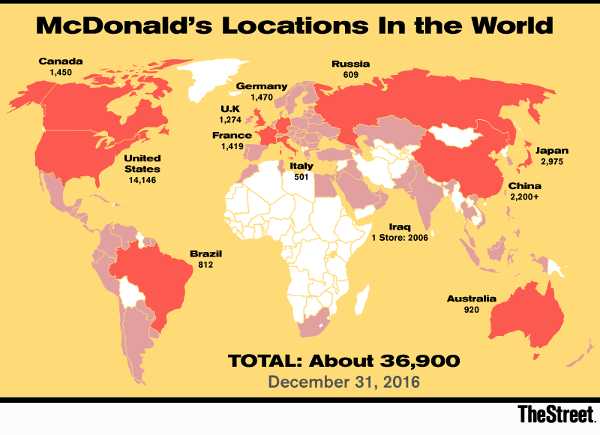 McDonald's followed suit, opening its first restaurant in mainland China in 1993, after first opening a store in Taiwan in 1984, and remains the second most popular American fast food option in the country. While the industry went through a boom era earlier this century, the fast food industry saw annual revenue grow from just over $10 billion in 1999 to $94 billion in 2013, there are signs that the good times are slowing. Amid increased competition in the burgeoning industry, Yum! announced that it was divesting its Yum! China operations into a separate publicly traded company named Yum China Holdings (YUMC - Get Report) . The move was unthinkable even five years prior as the unit accounted for about half of the company's total annual revenue and controlled about 40% of China's fast food market. At the end of 2014, Yum! had 6,715 stores in China after starting with just one in 1987. Being the shrewd business that it is, McDonald's is taking advantage of Yum! 's waning interest in the market and doubling down on its own efforts. Similar to Yum!, McDonald's agreed to sell most of the interest in its China operations to Carlyle Group and state-backed Chinese conglomerate CITIC Ltd (CTPCF . McDonald's will use the partnership to make its expansion in China less reliant on its own capital. McDonald's is aiming for double digit revenue growth in China over the next five years. McDonald's shares were down 0.5% to $154.20 Tuesday afternoon.